This dictionary is sourced from Shibata, Norio (ed.) 2003. Penrhyn-English Dictionary. (ELPR Publications Series A1-005). Kyoto: Nakanishi. This is the sole published dictionary of Penrhynese, but is out of print. In order to maintain some consistency over all the languages of this online Dictionary of Cook Island Languages, macrons have been used to mark long vowels. Shibata used the circumflex accent <ˆ> to mark long vowels. Upper case has been used to begin example sentences, which Shibata did not use. Apart from these changes the headwords and entry data are the same as that published in the Penrhyn-English Dictionary. However, it can be searched for both English and Penrhynese words, unlike the original hard copy version, which only has Penrhynese headwords. The project to create the online Dictionary of Cook Island Languages was instigated by Mr Rod Dixon, Campus Director, University of the South Pacific (USP), Cook Islands. Together with Professor Tania Ka’ai, Director of Te Ipukarea – National Māori Language Institute, they have spearheaded the project to have all the languages of the Cook Islands available online. The following text is a shortened and slightly changed version of the introduction to the hard copy dictionary. This dictionary describes the vocabulary of the Penrhyn dialect of the Cook Islands Māori language, which is hereafter referred to simply as Penrhynese or Penrhyn language. Penrhyn, the most northern island in the Cooks, is an atoll located approximately at 9’ S and 158’ W. The population was 606 in 1996 and 357 in 2001. There are two inhabited villages: Omoka and Tetautua. It is generally said that Penrhyn people living for good outside the atoll, mostly in Rarotonga, New Zealand and Australia, are three times as many as the home population. The number of Penrhynese speakers is more or less 1500, most of them being bilingual with Rarotongan or trilingual with Rarotongan and English, and that among them only 500 people speak the language daily. Penrhyn is connected to the capital island Rarotonga with a weekly air service and irregular sea communications. Telephone is available at almost every home. No TV broadcasting is transmitted to the atoll; but people enjoy video films. A medical doctor is stationed in Omoka. Circumstances are overwhelmingly maritime, but fishing is just for home consumption, except occasional exports of some shellfish and fish as well. Many men engage in pearl shell farming or other marine activities; many women in manufacturing pandanus works such as baskets, hats.and fans which are exported mainly to Rarotonga. Penrhynese is an Austronesian language belonging to Tahitic group of East Polynesian languages, Tahitian or Tuamotuan being one of the genetically closest languages besides Rarotongan and other dialects of Cook Islands Māori; New Zealand Māori language is also closely related. Data for compiling this dictionary was collected in the main through the fieldworks undertaken in 2000, 2001 and 2002, each year for about two months from the end of July through the middle of September. Besides, in 1989 and 1990, availing himself of casual opportunities, Shibata collected some Penrhynese words in Rarotonga (21° S and 160° W) and in Mangaia (the southernmost island of the Cooks, located at 22° S and 158° W). The data collected at those occasions was also included in this dictionary. The following is the list of Shibata’s informants who supplied most of data described in this dictionary. Born on March 23, 1923, in Rarotonga and died also in Rarotonga. Sessions: 4 days in October 1989 in Rarotonga, when he was 66 years old. Born on October 12, 1946, in Tetautua. Sessions: 8 days in August 1990 in Mangaia, when he was 43 years old and in service to the Oneroa CICC church. Born on April 7, 1924, in Omoka. Sessions: 4 days in 2000 and occasionally in 2001. Born on February 20, 1936, in Omoka. Sessions: 15 days in 2000, 24 days in 2001 and 33 days in 2002. Mrs. Mapere Matara, Mrs. Rakoroa Matara. Born on December 25, 1937, in Omoka. Sessions: 15 days in 2000, 23 days in 2001 and 33 days in 2002. Mrs. Tomanu Samuel, nee Akatapuria, Mrs. Ben Samuel. Born on November 2, 1931 in Omoka. Sessions: 21 days in 2001 and 32 days in 2002. Born on July 7, 1938, in Omoka. Sessions: occasionally in 2000, 2001 and 2002. Mrs. Doreen Elia/ Heria, nee Woonton, Mrs. Puma Heria. Born on November 10, 1942 in Omoka. The only preceding study on the Peurhyn language was The Structure of the Penrhyn Phrase [Ayako Yasuda 1968]. Shibata included into the dictionary the linguistic information on the Penrhynese taken from the dissertation only it could be confirmed with his informants. The author undertook her fieldwork from September 1966 through March 1967 in Auckland with Mrs. Maramaakura Taia as her chief informant, who was 57 years old at that time. The Penrhynese described in the dissertation is much more Rarotonganized than those of Shibata informants, except that of Mr. Viniki Tereora. During the fieldwork, Shibata also made use of such books as E. H. Lamont 1867, Peter Buck 1932, Andrew Teariki Campbell 1984 and Andrew R. T. Campbell (the same person as Andrew Teariki Campbell) 1985. He included in this dictionary some words, shown as such, from these authors. Penrhynese has 10 vowels: 5 short vowels /a, e, i, o, u/ and 5 long ones /ā, ē, ī, ō, ū/ the quantity is phonemic and the macron on vowel letters marks long vowels. Syntactically lengthened vowels are also marked with a macron. It has 11 consonants: /f, h, k, m, n, ng, p, r, s, t, v/. The digraph <ng> is to write a single phoneme /ng/of which the allophone is a velar nasal. The phoneme /f/ is a loan phoneme probably borrowed from Manihikian or Tahitian or both. The alphabetical order adopted in this dictionary is: < a, ā, e, ē, f, h, i, ī, k, m, n, ng, o, ō, p, r, s, t, u, ū, v >. A vowel letter followed by a hyphen is placed before the same vowel preceded by a hyphen, both of them preceding the vowel without a hyphen; thus a’s are ordered as < a-, -a, a, ā-, -ā, ā >. A raised comma /’/ is used to write a glottal stop in Rarotongan and other languages as well. Following English and non-English words are used freely inthis dictionary as if they are inordinary English vocabulary. Explanation is given below to those words. earth oven The earth oven is a traditional cooking method in Polynesia. Heated stones are used to contain heat underground to cook food on them. The Penrhynese word is umu which is ubiquitous in Polynesia. giant taro The giant taro (Alocasia macrorrhiza) is an ally of taro, which is called kape in Rarotongan and other islands. No giant taro grow in Penrhyn now. hibiscus The hibiscus is a tree that is rather rare in Penrhyn. A kind of hibiscus is called hau in Penrhyn; the leaves are heart-shaped and the flowers cup-shaped with five large petals that change from yellow to red in a day. Another kind is called kaute that is an ornamental tree planted around houses. lei Lei, which was originally a Hawaiian word, is a necklace or headband of any kind, made from flowers, shells, seeds, fruits, beads and so on. People give lei to arriving or departing families and friends to express their affection and love. The Penrhynese word is sei. marae The marae is considered both by pre-historians and local people as pre-Christian place of worship or communal meeting. Some maraes were elaborately constructed with stone structures, but some were just a set of stone hedges. Many are still conserved today and people still have some sort of reverence for their heritage. The Penrhynese word is marae. pandanus The pandanus or screw pine grows abundantly in Penrhyn. It is a tree with many branches and its lower part is supported with a clump of slanting aerial roots. The fruit is borne only on female individuals and are similar in shape to pineapples; the flowers are borne only on male individuals. The processed leaves are used to plait pandanus works such as baskets, hats and so on. The Penrhynese word is hara. 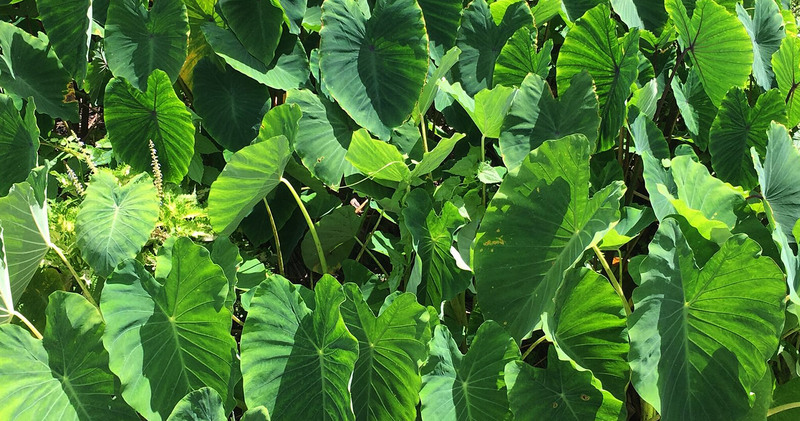 taro The taro (Colocasia esculenta) is a kind of aroid cultivated widely in the Pacific islands. At present no taro are planted in Penrhyn. The Penrhynese word is also taro. tridacna The tridacna shell (Tridacna maxima and other species) or the giant clam is abundant in the lagoon in Penrhyn. The Penrhynese word is pāsua. wild taro The wild taro (Cyrtosperma chamissonis) is a taro-like plant which grows in swampy areas on Penrhyn. It is less esteemed by people than the taro; but some people love the taste. 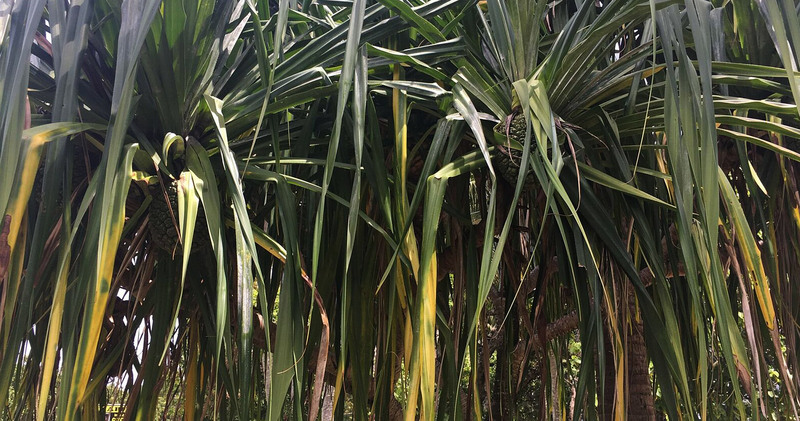 The stalk skin is used to decorate pandanus works. ‘Swamp taro’ is a synonym. Ant. antonym, antonymous expression. This term ‘antonym’ is used in a very broad sense. Caus, caus. Causative, causative verb. EL E. H. Lamont 1867. MK McCormack, Gerald & Judith Künzle. N(pn) proper noun, proper name. N(zn) zoological name other than fish names. Rel. related word or words, related expressions. pn. proper name. The name of marae is treated as a proper name, not a toponym. Syn. synonym, synonymous expression. This term ‘synonym’ is used in a very broad sense. var. variant, variety. This term is used rather loosely; it is sometimes synonymous with allomorph. ‘ ‘ encloses word or phrase meaning or name of function. 2) encloses a quotation from a publication, of which the phonemic form is not known. e.g. PB: 122 <te tau o Saupewa> is a quotation from the page 122 of Peter Buck’s ethnography of 1932. < 1) means ‘comes from’, e.g. “vō < vao” means that vō comes or originates from vao. “kereteki … (< Engl. cricket. )” means that kereteki comes the English word cricket. “Comes from” can mean borrowing, etymology, derivation, compounding or historical comparative. 2) shows growth or maturation stages of fish or plants; the left-side term is the younger stage, whilst the right-side the older. e.g. “uto kōtona < uto turi < uto pūkaka” means that a germinated coconut grows through these stages. || separates different kinds of information. e.g. “kiri … Pass. kirihia. || Ant. hohō. || Rar. kiriti. )” In most cases, the first section contains morphological information, the second one semantic or etymological, the third one comparative. 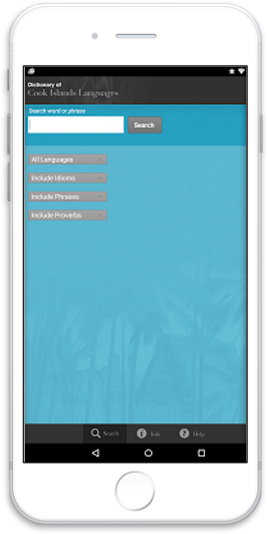 [ ] 1) encloses a phone or phonetic form in IPA. e.g. tabi [t∫açi]. ( ) 1) encloses a word or words omitted in English translation. encloses a Penrhynese word supplied in English context. e.g. “rough basket made of coconut frond (nīkau)”. 2) marks a non-existing word which is needed to explain the existing word or words. e.g. actually the form *kati does not exist, but entered as the base of other more complicated words like kakati, kākati, etc. 3) marks ungrammatical usage. e.g. “e aha koe i kanga ai (*i) uā meā na?” means the use of i in this sentence is ungrammatical or not customary. citation “hāmani mai koe θ ē rua kapu tī mā māua.”, the theta (θ) shows the absence of preposition.
? shows uncertainty or ‘not known’ concerning the preceding. (Of course, this symbol is used in the normal way at the end of an interrogative word or phrase or sentence.) e.g. “pahu-toka N(pn) ... (< pahu ‘?’ + toka ‘underwater rock’. )” means that the meaning of pahu in this personal name is not known. Italics 1) shows a scientific (biological) name. e.g. ‘‘trilobed Maori wrasse, Cheilinus trilobatus “. Boldface is Penrhynese affixes, formatives, words, phrases, expressions or sentences unless otherwise mentioned. Italic Boldface points the headword in an ambiguous context. e.g. “mai kō mai from there to here.” Means the second mai is the headwords concerned, not the first one. Abbott, R. Tucker & S. Peter Dance. 1982. Compendium of Seashells. New York: E. P. Dutton. Buck, Peter (alias Te Rangi Hiroa). 1932. Ethnology of Tongareva. (B. P. Bishop Museum Bulletin No. 92.) Honolulu: B. P. Bishop Museum. Buse, J. E. 1960. “Rarotongan Personal Pronouns.” Bulletin of the School of Oriental and African Studies, University of London. Vol. XXIII: Part I: pp. 123-137. London: The School of Oriental and African Studies. 1962 “The Structure of the Rarotongan Verbal Piece.” Bulletin of the School of Oriental and African Studies, University of London. Vol. XXVI: Part I: pp. 152-169. London: The School of Oriental and African Studies. 1963 “The Structure of Rarotongan Nominal, Negative, and Conjunctiva! Pieces.” Bulletin of the School of Oriental and African Studies, University of London. Vol. XXIII: Part 2: pp. 393-419. London: The School of Oriental and African Studies. 1963 “Rarotongan Sentence Structures.” Bulletin of the School of Oriental and African Studies, University of London. Vol. XXVI: Part 3: pp. 632-645. London: The School of Oriental and African Studies. 1965 “Problems of Morphology and Classification Illustrated from Rarotongan.” Lingua No. 15: pp. 32-47. Amsterdam: North-Holland Publishing House. Buse, Jasper & Raututi Taringa. Bruce Biggs & Rangi Moeka’a, eds. 1995 Cook Islands Maori Dictionary. Rarotonga: The Ministry of Education, Government of the Cook Islands. Campbell, Andrew R. T. (alias Campbell, Andrew Teariki). 1984. Impressions of Tongareva (Penrhyn Island). Suva: Institute of Pacific Studies, University of the South Pacific. 1985. Social Relations in Ancient Tongareva. (Pacific Anthropological Records No. 36.) Honolulu: B. P. Bishop Museum. Department of Land and Survey, NZ. 1986. Penrhyn, Cook Islands (a map). Wellington: Department of Land and Survey, NZ. Holyoak, D. T. 1980. Guide to Cook Islands Birds. Rarotonga: (?) The Library and Museum Society. ILCAA. 1966. Ajia-Afarika Genga Choosahyo (Vocabulary Checklist for Languages in Asia and Africa). Tokyo: ILCAA (Institute for the Study of Languages and Cultures in Asia and Africa). Kauraka Kauraka. 1982. Tales of Manihiki. Suva: Institute of Pacific Studies, University of the South Pacific. 1984 Legends from the Atolls. Suva: Institute of Pacific Studies, University of the South Pacific. 1987 E Au Tuatua Taito No Manihiki I Oral Traditions of Manihiki. Suva: Institute of Pacific Studies and the Cook Islands Extension Centre of University of the South Pacific. Lemaitre, Yves. 1973. Lexique du Tahtien.Contemporain: Tahitien-fram;ais & Frani;ais-tahitien. Paris: Office de la Recherche Scientifique et Technique Outre-Mer. Masuda, Hajime & Gerald A. Allen. 1987. Sea Fishes of the World: lndo-Pacific Region. Tokyo: Yama-Kei Publishers. Rensch, Karl H. 1988. Fish names of Eastern Polynesia. (Pacific Linguistics Series C, No. 106) Canberra: Research School of Pacific Studies, the Australian National University. Stimson, J. Frank. 1964. A Dicitonary of Some Tuamotuan Dialects of the Polynesian Languages. The Hague: Martinus Nijhoff. Survey Department, Cook Islands Government. 1980. 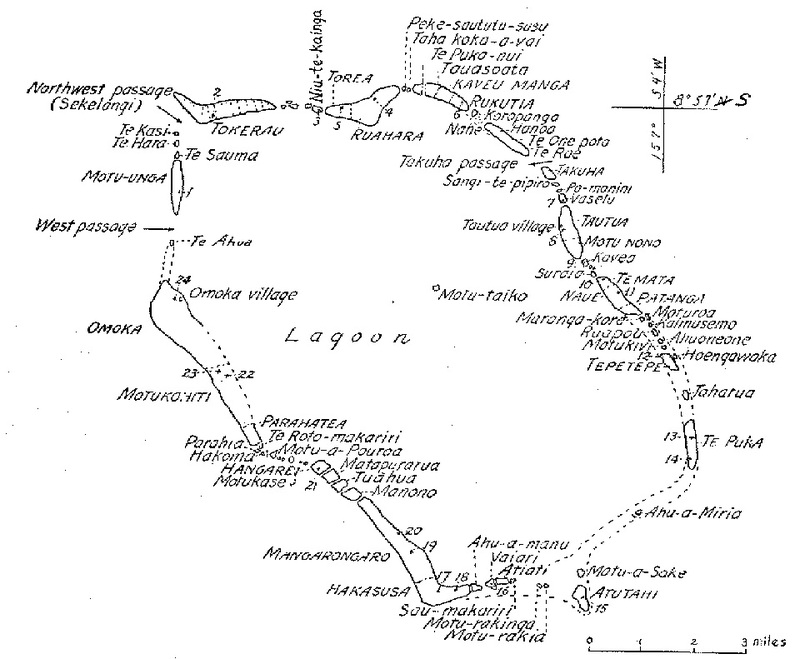 Maps of the Cook Islands (First Revision). Rarotonga: Survey Department. Whistler, W. Arthur. 1990. Ethnobotany of the Cook Islands: The Plants, their Maori Names, and their Uses. (Allertonia: A Series of Occasional Papers No.4.) Lawai, Kauai, Hawaii: National Tropical Botanical Garden.